The Tibetan Master Jamgon Kongtrul described various experiences that can come up during our meditation practice. These are temporary experiences that come up sometimes and we can see them as sort of a roadmap for our awakening. If we’re having experiences that are confusing to us, we can look at his list and see if they match. They are called nyams, which means flashes of experience. Nyams can be experienced both in sitting and in daily life, if we have a regular practice on the cushion and we’re mindful off the cushion. We want to notice these experiences but not really attach to them. They are temporary, but they can be used to keep us in the present. There are 5 nyam and 3 advanced nyam. They’re described through metaphor. I’m going to list them now. Brook on a Steep Hill: This is where our thoughts are very fast and busy. Our thoughts are said to be like water flowing downhill. It’s difficult to stop them or even slow them down. Turbulent River: Our minds are even more chaotic. Thoughts come like a river going through a rocky area, like whitewater rafting. Total chaos. Lots of thoughts that we can’t even begin to manage. Slow River: Thoughts become calm and familiar, smooth and slow. This is where we start to settle down. Sometimes we have to sit for a long time to get to this point in our sitting because our minds are so frantic. Ocean Without Waves: This is a space of absolute stillness, when we’re absorbed in our meditation. This is the point where a lot of people lose track of time in their meditation practice. Suddenly the timer goes off and you can’t believe it’s been 30 minutes. Candle Undisturbed by the Wind: This is a complete stillness. For a moment self and other drop away. There is no meditator, but just the act of meditation. And the advanced nyam. These are often only experienced on retreat, or at least in longer sitting periods. 6. Bliss: This is when we feel refreshed. We have a sense of well being. There might be tingling sensations and flashes of joy. Sometimes this nyam makes us feel inspired to go create something. 7. Luminosity: We gain a sense of clarity and a feeling of interconnectedness. Separation between ourselves and the world around us drops away. We have a panoramic vision that is beyond duality. 8. Nonthought: No thoughts arrive. There is a stillness and silence. Not only has the individual separation disappeared, the entire universe has disappeared and we are dwelling in the void. This is an experience that many people find terrifying. An intuitive understanding of Emptiness. These states can and do come up for many of us. All we can do is notice them and not cling to them. Sometimes people have those 6th or 7th nyam experiences and think they’ve attained Enlightenment. Weird experiences do come up if you practice for a long time. That’s part of the reason it’s important to have a teacher and/or spiritual community, to keep us from getting carried away. These days I tend to downplay the fact that I went through monk training. I lead a Zen meditation group now and I certainly don’t want to use the fact that I went through monk training to promote that in any way. That would be inappropriate. I was a monk school dropout. These days I’m just a lay teacher at my local non-sectarian Buddhist temple. And that’s just fine with me. I went through monk training with an organization that doesn’t have a good reputation. I don’t talk about it much because I don’t want to be perceived as talking bad about someone. I don’t know if there’s anything *wrong* with that organization really. They didn’t try to take money from me or anything like that. I just really didn’t connect with their lineage at all and there were a few weird things going on that I felt I couldn’t ignore. I don’t want to go into details about that here, but I will answer any questions privately on the subject. I’m careful to not mention the name of that organization. I just don’t connect with the teachings of Zen Master Seung Sahn and it seems like people in his lineage are often just repeating things in his teaching style. Which is fine. A lot of Buddhist teachers just repeat things from their teacher or just quote their teacher all the time. It’s not at all unusual. But it just wasn’t for me. In early Buddhism things were probably different than they are now. One would take the vows of a Novice, expressing the intent to walk the path of the Dharma, and then look for a teacher, probably studying with several different teachers to find the right one. That’s what Dogen did. That’s what Ikkyu did too. I took these novice vows a few years ago. But, I did leave that organization. It wasn’t a good fit for me, especially at that time in my life. The Sixth Precept: I vow to be kind and to encourage others, and to refrain from discouraging others including myself. The Seventh Precept: I vow to be kind to others and refrain from being boastful and self-centered. The Eighth Precept: I vow to be generous, to be grateful for what I have, and refrain from yearning for things that do not belong to me. The Ninth Precept: I vow to promote harmony and refrain from acting in anger or hatred. The Tenth Precept: I vow to affirm and uphold the three jewels (the Buddha, the Sangha and the Dharma). Now, I think people are largely expected to stay in an organization or stay with a teacher. But I’d like to suggest that that wasn’t always the case. This is speculation on my part, but I don’t think things used to be as rigid as they are now. Because students should have time to have the right teacher, if we’re going to have teachers at all. And having trouble finding the right teacher is, of course, no barrier to serious commitment to the path. This is generally how I think of myself. As a Novice Monk, as a wanderer, as a cloud. Some say that if you don’t keep going, if you don’t take more vows etc., then you have to give those vows back or something. I respectfully disagree. Vows are a lifetime commitment, and they’re something you take for yourself. They aren’t something you take for an organization. I’ve connected with a lot of teachers. I’ve studied with teachers on the internet and I’ve spent a little time on retreat with other teachers. I read Dogen and Ikkyu all the time, but I can’t really call them my teachers (they’re dead). There is a sad truth about Buddhism in the west that we don’t talk about much. And if you want a teacher to feed your ambition and tell you that you’ll become something great, you can find one. They are out there. From what I’ve seen a really good teacher doesn’t promise you anything. For the longest time I thought I should become a ‘GREAT Zen Master’. I read stories from Zen history about Bodhidharma, Huineng, Dogen, Huang Po, Xu Yun, Ikkyu, Basho, and many others. They are inspiring. Now I take that message to heart. Maezen is my favorite Zen teacher that I’ve met. I’ve talked to other Zen teachers on the internet over the years, and I really think that’s no substitute for real life practice. She’s a traveling Zen teacher. I can’t really have a formal relationship with her unless I become a traveling Zen student. But, I can tell you this: I served as her Jisha (attendant) on a weekend Zen retreat here in Kansas City and I think I learned more about the path in those three days than I ever thought possible. Now I lead a Zen meditation group, but I don’t think of myself as a teacher. I’m even teaching a class on the Diamond Sutra at the Rime Center and I’ll be teaching other classes in the future, but I’m still not sure I can think of myself as a teacher. Now after all this time, I really wonder why I wanted so badly to be a teacher in the first place. I read about Buddhism every day. I don’t read much else, really. I spend more time in Buddhist temples than a lot of people. And I love to write about Buddhism. I really really enjoy it. Maybe those are reasons why. Is getting credentials necessary in order to be able to write about Buddhism? I don’t think so. Jack Kerouac wrote about Buddhism. Alan Watts wrote about Buddhism too. Hell, even noted scholar D.T. Suzuki was not a Zen Master. People sometimes expect me to be an authority figure because I write about Buddhism. I’m about as out as you can be. No one that knows me wonders what my spiritual beliefs are. I’m always carrying Buddhist books. I’m talking about the Dharma to anyone who is interested. Oh, and I have some Buddhist symbols permanently on my body. On my right arm I have a blue lotus, an OM, a Bodhisattva, and an endless knot. So, anyone that wants to talk about Buddhism knows that I’m someone who they can talk to about it before they even know my name. Is that why I got these tattoos or is it because tattoos are cool? Who knows. I’m not an authority figure, not really. I’m as mired in suffering as everyone else. I’m confused and I make plenty of mistakes, probably more than my fair share. I’m not a role model. I am full of flaws. The only thing I can really do when people ask me for advice is point to the mistakes I made. I can definitely tell you what I did that didn’t work out well. My regrets are numerous. I’ve studied with several different organizations that give teachings online. We don’t have a Soto Zen community here in Kansas City and Soto Zen is what really speaks to me the most. It actually kind of bothers me. Wichita, KS has a Soto Zen temple. Cedar Rapids, IA has a Soto Zen Temple. Omaha, NE has a Soto Zen temple. But we don’t have one in Kansas City. We have a growing city, an amazing city, that’s becoming increasingly diverse. We’re a bigger city than Wichita. We should have a Soto Zen temple. I haven’t had great results, but that’s okay. I’ve learned a lot. You can learn about Zen online, but I don’t think you can really learn to walk the path. Sangha is important. Being with actual other Buddhists in real life is important. I was practicing with the Rime Sangha here the whole time, but I wanted a Zen Sangha. Being able to go to the Rime Center has been a great benefit to me. I can’t express how much being part of that community has meant to me. It’s a wonderful community, but a lot of that Tibetan stuff doesn’t hold much meaning for me. The Zen tradition is the one that really speaks to me. I’ve learned a lot in studying by myself and in studying with teachers on the internet. I can’t say that I’ve had a bad experience. I’ve been pretty thoroughly educated in Zen Buddhist history and theory. I actually learned a whole lot in studying with one of my teachers, Shi Da Dao on the internet. He gave me the Buddhist name that I use and gave me permission to teach in his lineage, the Empty Cloud Lineage of Xu Yun. He did this even though we never met in real life. I have trouble taking that seriously. Something about it definitely doesn’t feel real. I have to acknowledge that education and practice aren’t the same thing. There are Buddhist colleges that train ministers, plenty of them. But that’s not the way we become Buddhist clergy (whatever that means). All training is on the job. I think we do a disservice to the Dharma if we make it about training to be a minister. It should be about awakening. I’ve taken Bodhisattva Vows and done all sorts of other things. I’ve written about Bodhisattva Vows before and Dharma Transmission as well. I gave certificates. I am a ‘certified Dharma teacher’. I’m a teacher in the Tibetan tradition as well. I was given the title ‘Gegan’ (teacher) by Urgyen Palden Gocha. But, and this is important, Buddhism isn’t really something you learn. It’s something you do. My hero Ikkyu tore up his certifications when he got them because he didn’t take them seriously. I think Vows are something you take for yourself and not for some other person or organization. I believe those have meaning no matter what. Three things have traditionally been fundamental to Buddhist practice. One is practicing by yourself at home. The second is practicing with a community once in a while. The third is following an example, spending time with a teacher who has more experience than you. I’m no one’s master. That is clear. I’m just a wandering cloud. A student on the path, just like all of the other Buddhists. Although I’m like the kind of student who’s studying all the time. I won’t be your master. But I’d love to be your spiritual friend. I have three strings around my wrist. There are two red ones and a yellow one. One of the red ones is looking a little worn. I’ve had it for a while. It’s something people notice sometimes. Everyone knows I prefer the Zen tradition and strings aren’t part of that, but I have spent a great deal of time practicing in the Vajrayana tradition and it has meant a lot to me too. Each one has a different meaning. The first red one was given to me by Lama Chuck Stanford when he gave me Refuge Vows and I officially became Buddhist. The second red one was given to me by Lama Chuck when I took Bodhisattva Vows, deepening my Buddhist commitment. The yellow one was give to me by Lama Lena Feral, and it was blessed by her teacher Wangdor Rinpoche—a famous Vajrayana Buddhist teacher from Tibet who held several lineages. They are sometimes called blessing cords and sometimes called protection cords. They are used in several lineages of Tibetan Vajrayana Buddhism. These cords are blessed and given by Lamas on important occasions, for example when one takes vows. Taking vows is a part of most branches of Buddhism, but taking vows doesn’t always involve receiving a string. One can also be given a string when one does an important retreat or receives teachings from a well known teacher, especially secret teachings. I was given my yellow string because I received teachings from Lama Lena. In ancient times, people would just wear their cords until they fell apart. In the modern world they last much longer because we have synthetic material. Legend has it that these cords can bring good luck or offer some kind of protection. In the traditional practice the Lama ties a knot in the cord, blows a mantra into it, and makes a blessing. They say this allows you to take your teacher with you, even after they are long gone. Many religious traditions have this kind of process, where a teacher imbues an object with spiritual energy and blessings. Now, I’ll be honest and tell you, I don’t believe these strings provide any sort of protection or good luck. I’m skeptical of such things. But I do think they serve a purpose. I have a string that reminds me that I took Refuge Vows. It reminds me that I am a Buddhist and I should live mindfully. 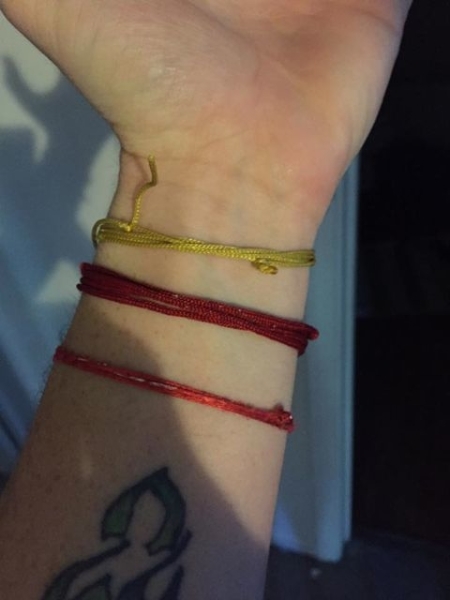 I have a string that reminds me that I took Bodhisattva Vows—that my purpose is to spread compassion and wisdom, to save as many beings and bring as many to Enlightenment as I can. And I have a string that reminds me that I have received additional teachings. This one reminds me that there is always more to learn and there are always more steps to take. I have three strings and I have seen people with more. I think reminders have some value. If you enjoyed this post, feel free to make a donation here.